This black and white illustration shows Confederate major general John Sapington Marmaduke, (1833-1887). Marmaduke, a 1857 graduate of West Point, began his military career with the commission of second lieutenant to the First United States Mounted Riflemen. He later transferred to the Second United States Cavalry where he served at Camp Floyd during the Mormon War (1858-1860). In April of 1861 the threat of a civil war prompted Marmaduke to resign his post from the United States Army. This departure allowed him to join the Confederate army and accept the commission of colonel of the First Missouri Rifles of the Missouri State Guard. He was promoted to colonel, on January 1, 1862, of the Third Confederate Infantry and on November 15, 1862, to brigadier general. Marmaduke led troops through the trans-Mississippi theater into a number of battles that included: Prairie Grove, Cape Girardeau, and the Red River Campaign. Marmaduke also joined Sterling Price for the final raid into Missouri. At the Battle of Mine Creek, on October 25,1864, Marmaduke and his men attempted to hold back Union forces but were instead captured while retreating. He spent the rest of the war in prison at Fort Warren, Massachusetts. On March 18, 1865 Marmaduke was promoted to major general, the last promotion issued by the Confederate army. 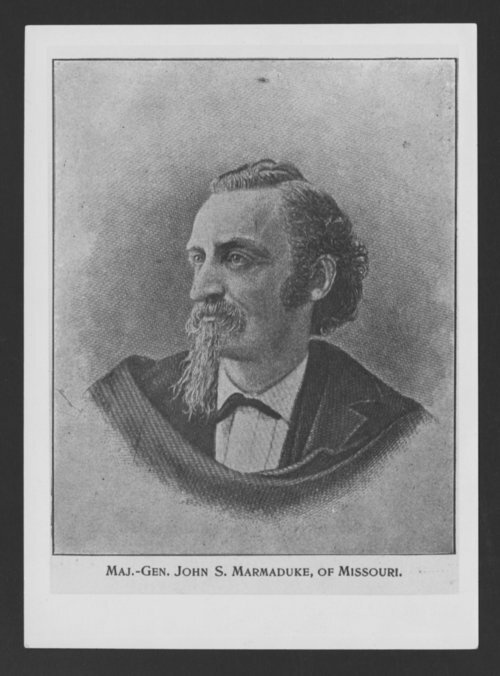 In 1884 Marmaduke made a bid for governor and became the first ex-Confederate elected to a major political office in Missouri.